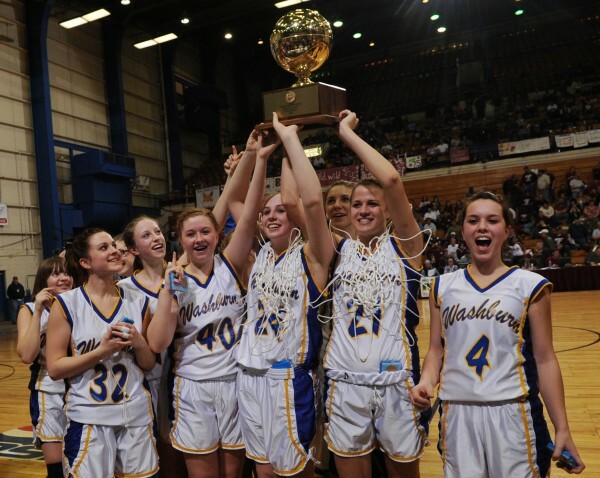 The Washburn girls basketball team hold the gold ball aloft after defeating Richmond at the Bangor Aduitotium on Saturday, March 5, 2011 during the Girls Class D State Championship. 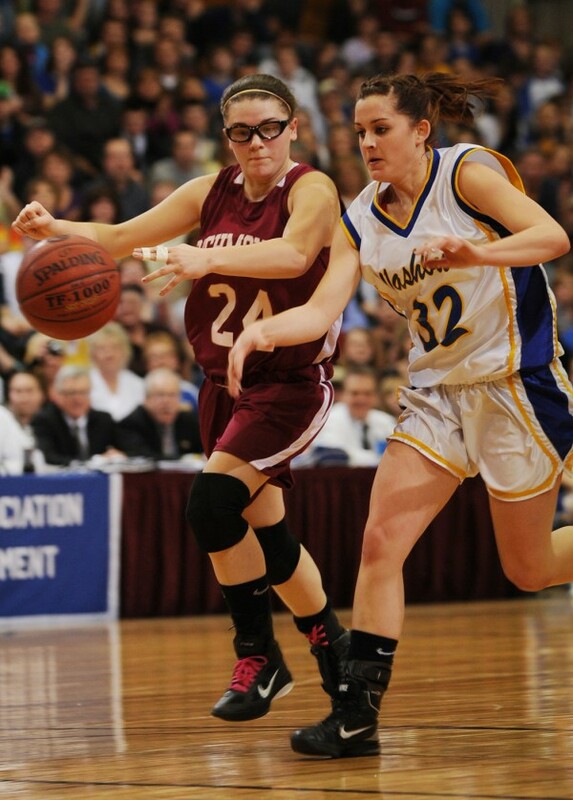 Washburn's Sarah Sjoberg, left, clings to the ball as Richmond's Jamie Plummer pulls it away during the Girls Class D state championship at the Bangor Auditorium on Saturday, March 5, 2011. Washburn's Meghan Saucier has the ball slapped away during a drive to the basket by Richmond's Payton Johnson during the Girls Class D state Championship at the Bangor Auditorium on Saturday, March 5, 2011. Washburn won. BANGOR — It took the better part of a generation, but the fans, family and players connected to Washburn High School’s girls basketball team don’t seem to mind the wait. A 22-year wait for another gold ball after Washburn had won three in four years (1986-89) ended Saturday afternoon as the young Beavers used dogged defensive pressure, a resilient rebounding effort, and solid shooting to wear down an even younger Richmond squad in what became a game of attrition. Washburn retook an early lead with 29 seconds left in the first quarter, never gave it back, and never let it dip below four points in the second half en route to a 43-30 victory at the Bangor Auditorium. One week after battling big foul trouble and having to watch her teammates battle back from a 17-point deficit, senior Rebecca Campbell made it much less stressful on herself, her coach and fans as she avoided foul trouble — no small feat in a game featuring 39 fouls — and led the Beavers to victory with 22 points, eight rebounds, three assists, two steals and a block. “Ninety percent of this was done with defense,” said Campbell. “It was an intense game, but not as intense as expected for some of us. We were kind of nervous to start, but I think our defense hit them hard and we settled down and got into the game pretty early. The 20-2 Beavers got production from old and young alike as freshman Carsyn Koch came off the bench to contribute six points, 11 rebounds (eight in the fourth quarter), two steals and an assist. Classmate Carmen Bragg had nine points, two assists, two steals and two rebounds. The two teams combined for 55 turnovers with Richmond owning 29 of them. “I call it southern basketball,” said Washburn coach Mike Carlos. “We’re going to put as much pressure on you and we’re going to keep the pace as fast as we can, and we’re going to lose the ball sometimes, but we’ll hopefully get more than we lose and come up on the winning end. Washburn’s halfcourt trap, zone and fullcourt press defense seemed to have at least some effect on the 20-2 Bobcats. Richmond shot just 22.2 percent from the floor and 35.7 percent from the line. Six-foot sophomore center Jamie Plummer managed a double-double (14 points, 11 rebounds) despite playing on legs that have experienced chronic pain all season. Bobcats 5-9 senior forward Tara Hurley finished with nine points. Alyssa Pearson, the other half of Richmond’s twin tower frontcourt at 5-11, was limited to four rebounds and no points. “We had Sarah Sjoberg on Plummer, and we doubled up on anyone who had the ball,” said Campbell. The Bobcats cut Washburn’s lead to eight points with 1:38 to play, but the Beavers got a little more patient on offense, forcing Richmond to foul. The Beavers then hit four of five free throws in the last 90 seconds to maintain the lead, but never let up on the defensive pressure and Richmond was held scoreless in the last 70 seconds.. The significance of the title victory was obvious, even to freshmen who had no prior tournament experience.